In cases such as cancer or various other pathologies, there is almost no choice except to remove the uterus. Hysterectomy comes from the Greek words “hysteron,” which means uterus or womb, and “ectomy,” which means excision or removal. Hysterectomy is one of the most commonly performed gynecological surgical procedures. The removal of the uterus can be complete or partial. Partial hysterectomies consist of leaving the cervix if medical contraindications exist. Many times the ovaries and tubes are removed along with the uterus. Hysterectomy is an irreversible procedure after which a woman is no longer able to become pregnant or have a period. Given that hysterectomy is a final, permanent, and definitive treatment, it should be performed in patients who have not responded to more conservative surgery or medical treatment (with hormones and other medicine). Drs. Nezhat have extensive experience in laparoscopic removal of the uterus. In fact, laparoscopic removal of the uterus and lymph nodes close to the aorta was pioneered by Drs. Nezhat. They resort to a hysterectomy as the last treatment option, focusing their efforts first on infertility treatments and restoration. Our centers offer state-of-the-art consultation to tailor the treatment based on the individual medical condition and needs of our patients. Our experience in the field of minimally invasive surgery offers our patients the benefits of definitive treatment of hysterectomy coupled with a short hospital stay, fast recovery, and extremely minimal scarring. 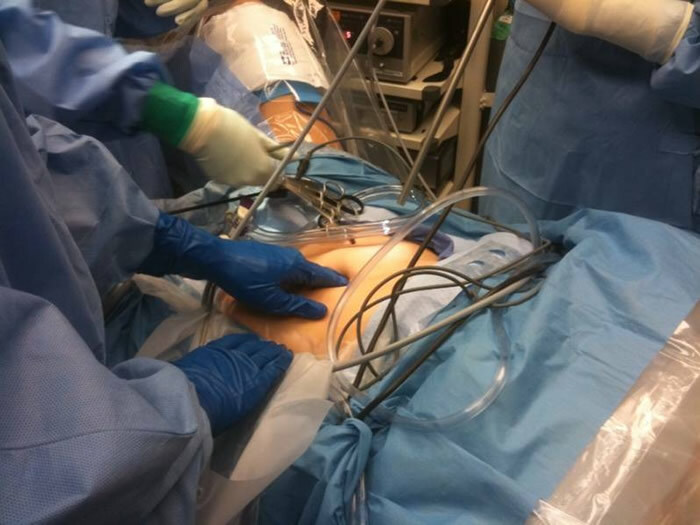 The procedure is performed in most circumstances on an outpatient basis with usually less than 24 hours hospital stay (compared to a typical three-day stay after an “open” abdominal approach). Recovery is faster (approximately 1-2 weeks) compared to that of traditional abdominal surgery (4-6 weeks). Our experience in the field of minimally invasive (laparoscopic) surgery has left thousands of our patients symptom-free and healthy for more than two decades.